The weighs 1oz (about 30 grams) and is about 44mm wide. 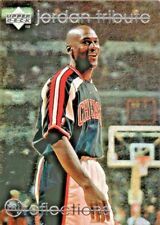 MICHAEL JORDAN, CHICAGO BULLS, RARE U/D 'HE'S BACK MARCH 19 1995' CARD, 5. This will make a great addition for anyJordan or Bulls fans collection. You will receive the exact card shown in the photo. Back and front of card shown but there is 1 card only. You are buying a rare M ICHAEL JORDAN card as described below. MICHAEL JORDAN, CHICAGO BULLS, RARE U/D 'HE'S BACK MARCH 19 1995' CARD, 1. MICHAEL JORDAN 2009 UPPER DECK LEGACY 50-CARD BOX SET WITH OVERSIZED CARD. The box is unsealed but all the cards are brand new. The oversized card is in a wrapper. All the cards are in great condition. Message if you need anymore pics. Dispatched with Royal Mail Signed For® 2nd Class. Rare Card in this Condition. Flair Showcase. winner also will get 5 cards as bonus (include random insert card, normal cards, finest, bowman,etc). YEAR : 1996. Sport Basketball. Genuine 23 Karat Gold Card. GRADED GEM-MINT. Professionally Graded Graded. Light refractor cards, colours change as the light changes as shown in pictures 1 and 2. 1999 Flashback Rookie Victory/ Upper Deck card that has been paired with a piece of Game Used Shoe worn by play Michael Jordan. This has been sealed in a tamper proof case in mint condition, and is authenticated by World Class Grading. 90-91: MORE HONOURS FOR JORDAN. UPPER DECK CARD DISPLAY. 1984 - 1998. ALL HAVE UPPER DECK HOLOGRAMS VERSO. (13 CARDS IN THE DISPLAY). ALL THE CARDS IN NEW CONDITION IN THE PROTECTIVE CASINGS. 91-92: 6/3/92: A WIN TO START FINALS. THIS CARD IS FROM 2018-19 PANINI PRIZM SENSATIONAL SIGNATURES PRIZMS MOJO. CARD IS SERIAL NUMBERED 14 / 25. MICHAEL JORDAN, CHICAGO BULLS, RARE U/D 'HE'S BACK MARCH 19 1995' CARD, 2. This is a card from theUpper Deck 1993-94 NBA Basketball German set. The card is in very good condition and is the following. MICHAEL JORDAN, CHICAGO BULLS, RARE U/D 'HE'S BACK MARCH 19 1995' CARD, 4. MICHAEL JORDAN, CHICAGO BULLS, RARE U/D 'HE'S BACK MARCH 19 1995' CARD, 8. Mint condition MJ is back #45. This is a card from theUpper Deck 1991-92 NBA Basketball International Spanish set. This is a very rare Michael Jordan Sample Basketball Card. Not available to the general public. Is in mint condition and comes in protective holder. 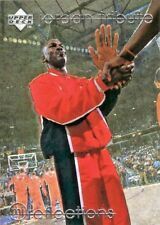 In the 1995–96 season, the Chicago Bulls set the NBA record for wins, finishing the season 72–10. They then defeated the Seattle SuperSonics in the 1996 NBA Finals, winning their fourth NBA title in six seasons. This GENUINE LOT CONSISTS OF: 92 MOSTLY different (WE HAVE NOT CHECKED FOR DUPLICATES) BASKETBALL trading gum cards issued by: NBA & are in generally very good plus condition. WE HAVE TRIED TO DISPLAY/DESCRIBE TO THE BEST OF OUR ABILITY BUT TRADING CARDS ARE NOT A STRONG SUBJECT OF OURS. MICHAEL JORDAN, CHICAGO BULLS, RARE U/D 'HE'S BACK MARCH 19 1995' CARD, 3. MICHAEL JORDAN, CHICAGO BULLS, RARE U/D 'HE'S BACK MARCH 19 1995' CARD, 6. MICHAEL JORDAN, CHICAGO BULLS, RARE U/D 'HE'S BACK MARCH 19 1995' CARD, 9. Player - Nikola Mirotic. Player: Nikola Mirotic. Player Nikola Mirotic. Team - Chicago Bulls. Team: Chicago Bulls. Manufacturer - Panini. Card Manufacturer: Panini. Team Chicago Bulls. Genuine 23kt Gold Card. 1986 Fleer Rookie Red/White/Blue Card (1998). winner also will get 5 cards as bonus (include random insert card, normal cards, finest, bowman,etc). Original/Reprint Reprint. "LIMITED EDITION".